Linoleum is ideally suited for such areas as the kitchen, bath, hallway. It is strong enough, waterproof, wear-resistant. It has good elasticity. The buyer is captivated by the simplicity of caring for him and the large variety of this material in the construction markets. How to lay linoleum on a wooden floor? What should be considered in this work? All of this will be discussed below. Figure 1. Floor covering with plywood. Polyvinyl chloride. It is made of polymer fibers foam material. Its lining may have a fabric base or be completely absent. A large range of colors of such linoleum, with a variety of patterns. An alkyd type of linoleum is made on the basis of various resins (alkyd), using mineral fillers and various pigments. Its lining can be made of natural material or synthetic. 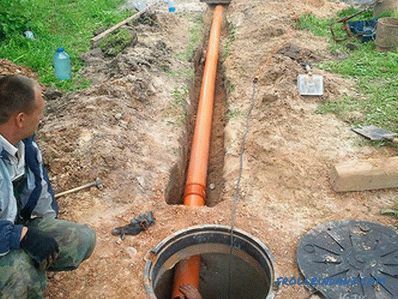 It has high thermal and sound insulation characteristics, resistant to abrasion. But it has a drawback: increased fragility and tendency to fracture and cracking. Available in monochrome version, and with a different pattern. 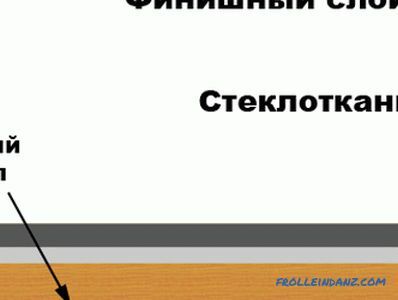 Relin - linoleum from rubber. Available in thicknesses up to 3 mm. The lining is made of a mixture of rubber residues of various industries, and the top layer of rubber of different colors. It has high moisture resistance and elasticity. Used in the coating of industrial premises. Material without a base, collaxyl linoleum. It is produced using nitrocellulose. It is characterized by good moisture resistance, fireproof enough form and has a high elasticity. Figure 2. 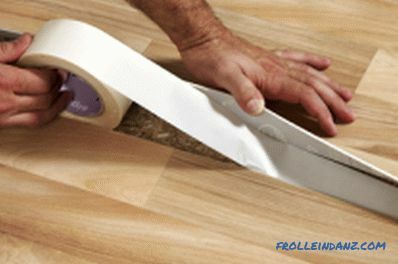 When laying linoleum, double-sided tape can be used instead of glue - this will significantly speed up the process. Its surface has some luster. The drawings applied on this type of linoleum are covered with a protective layer. 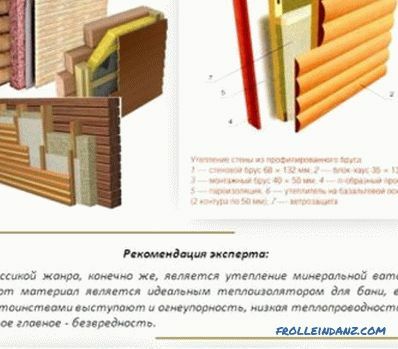 To cover the wooden floor in a residential area, the first option is usually used, which is selected according to the best thermal and sound insulation characteristics. How to lay linoleum on a wooden base (floor)? To do this, you must first purchase a suitable type of material for the room to be covered. 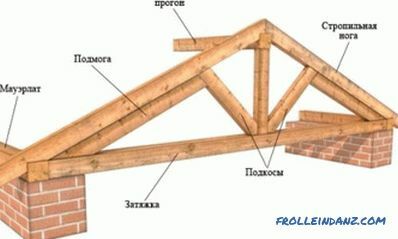 In the construction markets there is a huge variety of this product, so everything depends on the client and his taste. After acquiring linoleum, it is necessary to lay it for 2-3 days in the room where it is planned to be used. This is necessary in order for the material to acquire the desired temperature. During this period, it is necessary to prepare the surface. The wooden floor should be perfectly level. If there are cracks or irregularities on the basis, then all this will be reflected when linoleum is laid on the wooden floor. Figure 3. If the floor area is more than 18 square meters, then it is better to use glue for laying linoleum, applying it spatula or roller. Since the floor is deformed over the period of operation, it is necessary to lay sheets of hardboard or plywood on it. 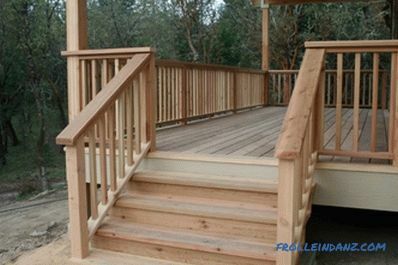 In good condition of the wooden floor material, the thickness of the coating plates is chosen to be 6-9 mm. If not, then the hardboard or plywood should be up to 16 mm thick. The wooden floor is free of old paint with a spatula. Hammer nails into coating boards to a depth of 8 mm using a punch and a hammer. If some of them creak when walking, then they should additionally be nailed to the logs. The floor surface is leveled using a planer or a parquet machine is used. After this, it is necessary to vacuum the surface or wipe with a wet cloth and dry well. When flooring with plywood, glue is used for parquet or PVA. It should be laid at an offset of 1/2 sheet. Additionally, the material is nailed (Fig. 1). The joints between the individual plates are puttied with mastic made on the basis of the glue that was used to glue the plywood. The joints must be sanded. After drying, the putty impregnates the plywood sheets with linseed oil. 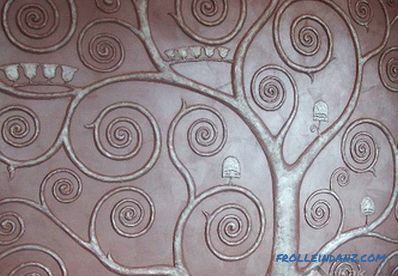 Stele linoleum without the use of glue. 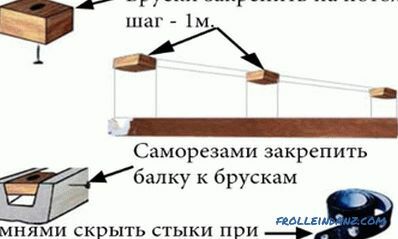 This method allows you to do the work very quickly, but it is intended for rooms with an area of ​​less than 10 m², where people do not walk so often. It protects the material from rapid wear. Fixing linoleum carried out using double-sided tape. This allows you to quickly remove it, although traces of glue may remain on a wooden base. If the canvas is simply laid on the floor, then unnecessary pieces are cut along the baseboard, and in the doorways of the doors the linoleum is fixed with metal slats. 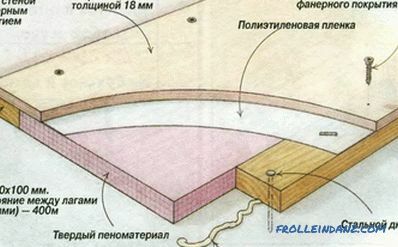 If double-adhesive tape is used, it is glued to the floor around the perimeter of the room, and then, removing the protective paper, they apply 1 side of the roll and smooth it (Fig. 2). After this, the same process is repeated with its 2nd part. Surpluses are cut off along the plinth, and at the door they engage with slats. To overlap the room with linoleum, use glue if the area of ​​the room is more than 18 m². To do this, spread the canvas on the floor, leaving a margin on baseboards (up to 12 cm). Then begin to smooth it from the middle of the room to the corners. To make the material fit well to the base, small cuts are made in it. First, glue 1 half of the roll, smoothing the sheet from the center of the room to the walls. 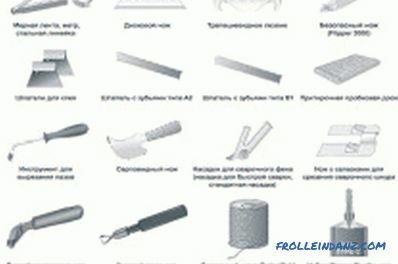 Glue is applied to the material with a roller or spatula with teeth. Leave for 15-25 minutes for setting, and then the 2nd half of the roll is also glued (fig. 3). The edges of the walls are clamped with baseboards, and the excess linoleum is cut with a knife. In doorways it is necessary to do this with the help of metal slats. To lay linoleum on a wooden floor by yourself is a completely feasible task and does not require special knowledge. To do this, you must adhere to the above recommendations and do not deviate from the technology of production of such works.